I’ve had many wines made by former football players and coaches, but none of these wines that are licensed by teams. Obviously, I LOVE the idea of a team backing grapes over hops for their fans but I always want the wines to actually be good too. 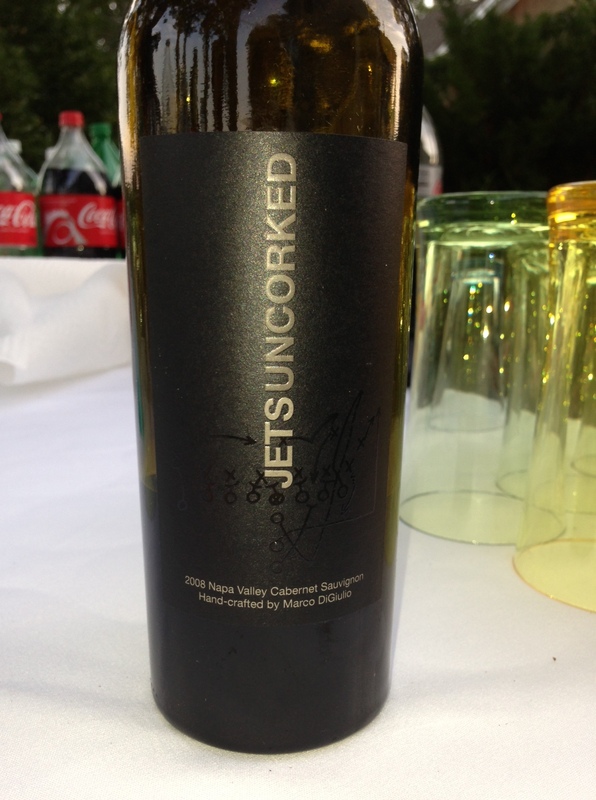 I’d heard about the Jets Uncorked for a few years, and finally had it! It was kind of random because I was at this huge BBQ at someone’s house on the North Fork on Long Island this summer, when football was far from my mind. They had a full bar, and even though I normally would’ve gone for white since it was hot out and I was about to eat lobster, I spied this lone bottle of Jets Uncorked on the table and went straight for it! The bartenders were like, “Why is this chick taking pictures of the wine and not letting us just pour?” Little did they know they were in the presence of grapefriend. So how was it? Not bad! Not super complex but, to me, most Napa Cabs aren’t. It had some good blackberry and was actually very velvety. Nothing you’re going to create a touchdown dance for, but fully drinkable especially for $28, which is cheap for most Napa Cabs. And honestly, it might be better than the Jets are right now. I sort of pull for the Jets since they’re a fellow NY team, but being a Jets fan seems like a world of pain. I’m glad they have this wine to ease some of that. Tags: cabernet, food & drink, football, jets, napa, wine. Bookmark the permalink. Previous post ← running backs – they’re just like wine! Apologize if this is a repeat. I seem to think that i commented already. We, in Canada, have an unusually woeful football team, the Toronto Argonauts. It would be a courageous act to produce a wine with their name on it unless you wanted to be associated with failure. Then again, the Jets aren’t exactly recent Super Bowl champs. Must be the loyal fans. Reblogged this on Dawna Boone. Too fun!!! It constantly amazes me how you know about all the wines affiliated with movie stars, rock stars, and now, sports stars/teams! How do you do it??? However, the question arises if the wine would cost less if it wasn’t named after an American football team. In my opinion sport teams and celebrities (like Angelina Jolie and Brad Pitt with their Miraval) that enter the wine business usually overprice their wines.